So, November is upon us. Wow. I don't get all jazzed up about pumpkin everything like the rest of the world, so I can't say I'm super pumped about this. (Don't get me wrong, I actually love pumpkin, but I think the marketing of this product is getting beyond out-of-control). The good news is that the onset of November means I can really start thinking about holiday entertaining. After Remembrance Day, it's full-on holiday mode here. This is where my love of all things maple, peppermint, or eggnog shine through. That's right people. Maple, peppermint and eggnog are my pumpkin. Coconut too. But coconut is more of a year-round love of mine. This year, I came up with a new chicken wing. It uses one of the ingredients that I wrote about earlier....MAPLE! Oh maple, how I love you. One of my most favorite and recent creations uses maple too. Please check out my Gingersnap Maple Pecan Ice Cream if you haven't already! You will not regret it. These wings are SO easy. They use so few ingredients. Ramp up the pepper if you really love it. Hold back if the kids complain. Let me assure you though, with the amounts noted below, I witnessed both a 9 month old baby delightfully eat pieces of this wing, and grown-ups heap their plates with these little delights. What's not to love here?! -Preheat your oven to 425F and line two baking sheets with parchment paper. Use parchment paper. It is so much easier for clean-up than simply greasing your pan. -Mix together flour, ground pepper, salt and garlic powder in a small bowl. Transfer to a large ziploc freezer bag. Dump approximately half the wings into the flour mixture in the bag and toss to lightly coat. Lay out in an even layer on the prepared baking sheet. Repeat with the remaining wings. Both times I made these I had exactly enough flour mixture to evenly coat the wings. I find that if you do this step quickly and don't dilly-dally, then the first set of wings don't soak up all the mixture before you get the next batch in the bag. I hate when I run out of a coating for meat, so trust me when I say these amounts are enough! If you have an extra large ziploc bag, just coat the wings in one big batch. -Place wings in the preheated oven. Set timer for 40 minutes. Rotate the top and bottom rack pans at each 10 minute mark, and flip all the wings at the 20 minute mark. -While babysitting your wings, make the glaze. In a small saucepan, combine all ingredients. Over medium heat, bring to a boil, stirring occasionally. Reduce to low and allow to simmer for 2 to 3 minutes, or until the mixture starts to thicken up just slightly. Remove from heat and cover to keep warm. -After your rotating and flipping adventure of the pans of wings is complete, you're ready to glaze. Brush each wing with some glaze and return to the oven for 7 minutes. Remove from the oven and flip each wing. Re-glaze and return to the oven for an additional 7 minutes. This time, watch carefully because that first layer of glaze is starting to get quite sticky. At the 5 minute mark, check on them. The glaze will start to scorch very quickly if you overcook them. It's better to take them out a bit early and sacrifice a bit of caramelization than to wind up with burnt and crusty sugar! Now eat them! For additional maple goodness, drizzle a tiny bit of syrup over the finished wings before serving. - If you need to take these to an event (like the potluck I took them to), I recommend putting them in a lightly greased slow cooker right out of the oven. 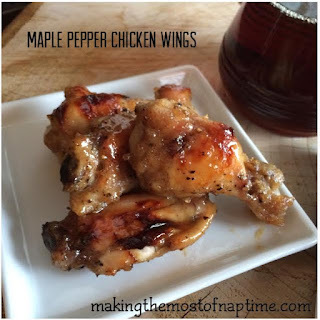 I drizzled a tiny bit of plain maple syrup between the layers of wings just for that extra maple punch . Place on the "warm" setting and enjoy! -You can freeze these too! Just cool slightly after removing them from the oven and place in an airtight container. Fully thaw prior to reheating at 325F until warm.